In June, Bret and I spent one week in Great Britain. I planned on summarizing that week in a few blog posts this summer and I’ve really fallen behind on those (sorry!) but I’m back. Here’s Day 4! (You can catch up on the first few days here). After a completely perfect day exploring our new favorite city: Edinburgh, Scotland, we woke up early as usual, packed our backpacks, and enjoyed a traditional Scottish breakfast in the hotel. Then, we boarded the bus and began our drive up to Inverness! 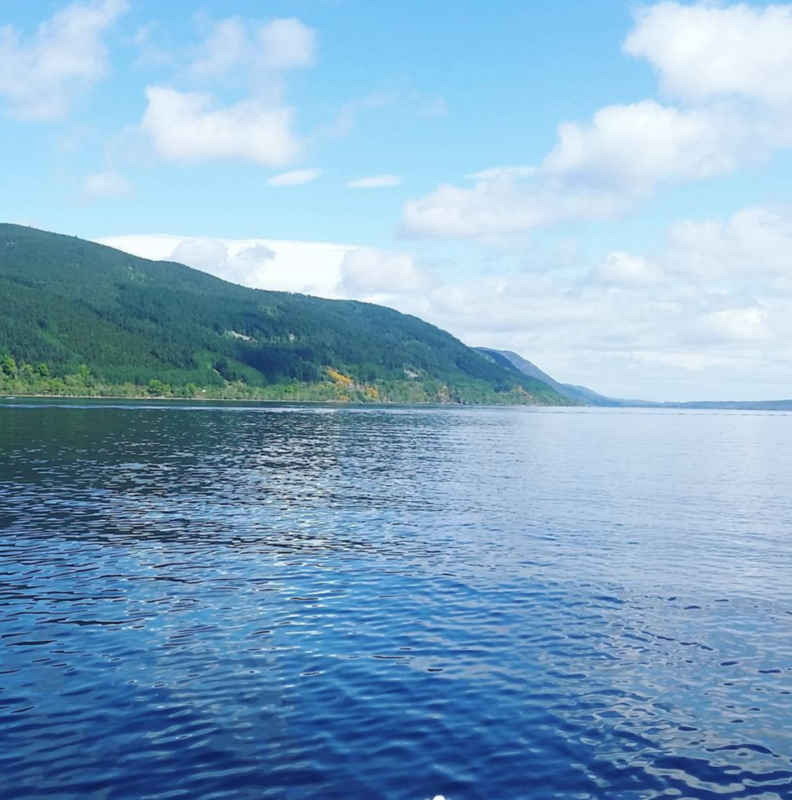 We did not realize how many hours we would spend on the bus on this day, which is probably a good thing, but we were excited to begin with an epic boat ride across Loch Ness. I learned “Loch” means “Lake”. In the U.S., we’d probably call it Ness Lake. In Scotland, we call it Loch Ness. In addition to that tidbit, I learned so many Loch Ness facts Loch Ness Monster legends on the boat! We had perfect, perfect, perfect weather. 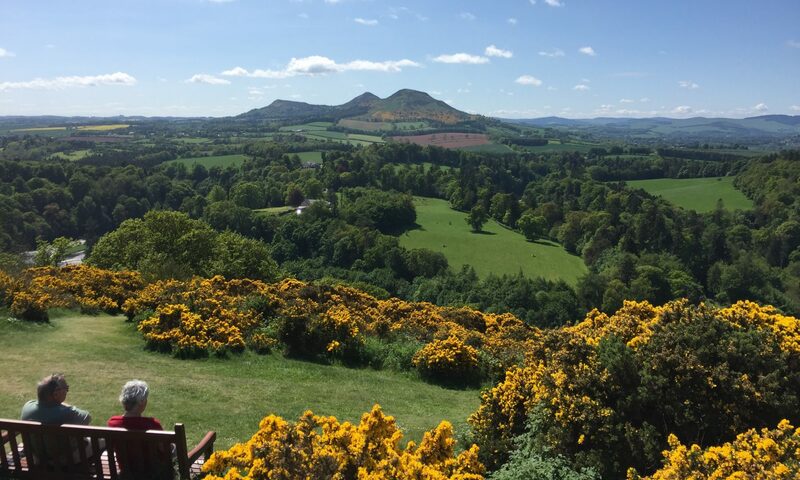 Again, we were constantly reminded that the clear skies were a rarity in Scotland, and we were thankful for this gift of incredible views. For lunch, we ordered food at a little diner/gift shop. There was hardly enough room for our whole group, but we managed. Our only regret was not buying an extra water bottle or two there whiles we had the chance. We didn’t know, but access to food and water would be limited after this stop. Next, we drove on scary roads on the side of a cliff. I tried to relax but it was pretty terrifying, and I began to understand how Bret feels in a plane. I hated it. I took some photos to show how close we were to the edge of the cliff. I forced myself to take pictures knowing I’d never be on this road again for the rest of my life. Well. As you’ve heard, all of these photos are lost now. Fortunately, the image of staring down a mountain side is burned in my memory. 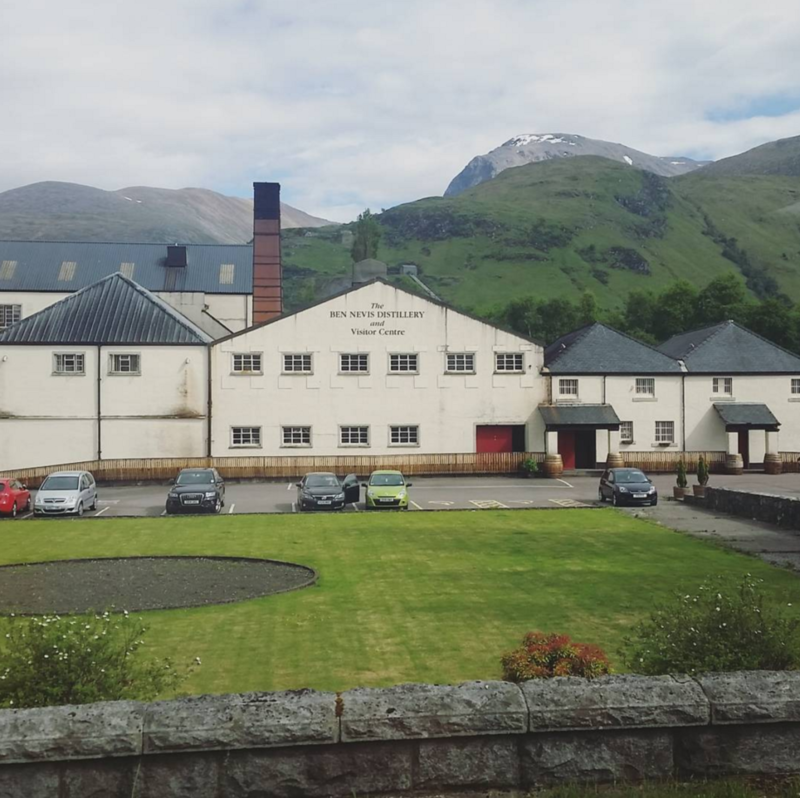 We stopped at a memorial for some beautiful scenery, and then our next stop was the Ben Nevis whiskey tour! The tour would have been better if I wasn’t feeling ill, but I wasn’t feeling well, so standing in the equivalent of attic floor boards smelling a mixture of hot beer and whiskey was unpleasant for me. The tour was interesting, though, and we were invited to sample some whiskey at the end! I still wasn’t feeling well, and I’m not really a whiskey person, but I’m glad I forced it down for the experience. Unexpected fact: we learned that the tallest mountain in the Scottish Highlands does not even reach 3,000 feet. Boone sits at 3,300 feet. Next, we got back on the bus. I was really thirsty, but there was no water. We were hoping for a familiar “comfort stop” where I could buy some snacks and hot tea, but our bus driver told us: “The next stop is trees” so we had to go a few hours with no water. Not ideal. We drove through more scary roads and eventually arrived in a village in Scotland called Arrochar. I’d never been so grateful to lie down in a hotel bed. I took some medicine and started to feel much better. Thankfully, we had dinner planned at the hotel. This was necessary because we were in a small, sleepy town and there were no dinner options in walking distance, but I was especially grateful because, as I mentioned, I was not feeling well. At dinner, we met a new friend and talked about accents and Austrialian stereotypes. Did you know in Australia people shoot kangaroos like we shoot deer? It’s true. After dinner, We walked around outside (the sun doesn’t set until 10pm!) and hung out with our friends. This is also the night when I realized how much older we are than our newly acquired friend group. They we shocked that we were over 25 and could not BELIEVE that Bret was over 30. It cracked me up when I realized some of them were 18. Here we are in Arrochar! After exploring and chatting, we found a comfy place to hang out in the lobby. Bret got a free soda from the bar (he was THRILLED). And we just sat around and hung out with friends. We really wanted to stay up later, but as per usual, we knew we’d have to wake up before 6am, so we reluctantly went to bed at midnight. Honestly, it feels like most of this day was spent on the bus. 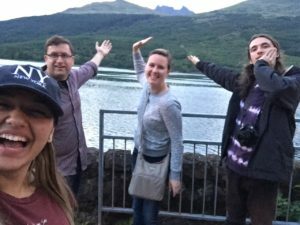 It would have been a wash if it wasn’t for the Loch Ness tour and then hanging out with our new friends in the hotel after dinner. Truthfully, it was amazing to see the Highlands… but it was a lot to absorb in one day. To do all of this, we had to spend over 7 hours on the road. At least we didn’t have to drive anywhere ourselves. That was it for Scotland! Next up, England and Wales!